In recent years it has become noticeable that many women and children who seek support from the Sreepur project come from an area in the north of Bangladesh where some of the poorest people on the planet live. They are known as “char dwellers”. The chars are tiny islands formed from sedimentation in the major rivers that flow into Bangladesh from the Himalayas. For centuries , the char farmers have eked out an existence at the mercy of South Aisia’s great rivers , but as temperatures rise , time is running out for them. The chars are very fertile and can produce rich crops of mango, banana, guava, jackfruit and bamboo , but with changing climate the flooding grows ever more extreme and unpredictable and without warning a char can be swept away along with all who were living there. After a period of extreme weather the men often head for the cities in desperation to seek work. This leaves the women and children in a very vulnerable position . There are damaged houses, no roads, no schools, no medical facilities, no infrastructure at all. It’s life on the edge. 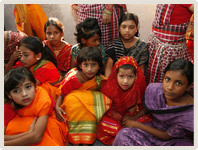 The Sreepur project is now developing a support centre in the area to help the women and children most in need. The money from the purchase of Sreepur card can make a world of difference for these vulnerable people. 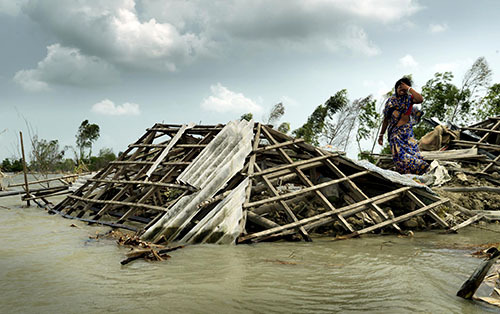 The video below shows how Sreepur is supporting the victims of climate change.